John William Tolleson is not my ancestor. If my great-great-grandmother’s life had turned out a bit differently, however, I wouldn’t be here. She was once engaged to John William Tolleson. February 4, 1894: “After my usual prayer, I retired. Mr. A- and I burned my letters from J.W.T. 44 in No. Even in her diary, Stella rarely vents her personal, private thoughts, but reading between the lines, it looks as if the engagement was already over or going sour by the time she began the diary. I did find it interesting that a little more than a week after she heard of his marriage, she pulled out J.W. Tolleson’s letters to her and re-read them. In a symbolic act to sever ties to the past, she and her fiancé Amos Cunningham burned some letters from J.W. Tolleson. However, I understand that some of these letters survived the purge. I am not sure how long the engagement lasted or whether Stella and J.W. Tolleson kept in touch. On a lark, I decided to see if I could discover what happened to him. I was armed with a fair amount of information from Stella’s diary. I knew his initials and last name. He had married a woman named Minnie Mathis. Stella seemed to know Minnie. He was probably about the same age as Stella. I searched Ancestry.com and found him on the 1910 and 1920 censuses with his wife Minnie (click thumnails for larger images). 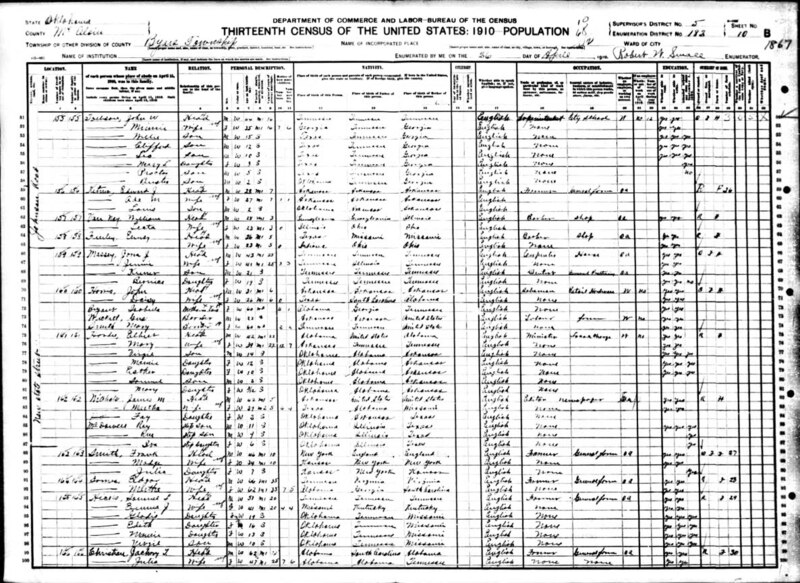 Based on information from these census records, I was able to learn his first name was John, and that he was born in about 1865, which made him about two years older than Stella. I also learned that he moved to Oklahoma. On the 1910 census, his occupation is “Superintendent” at the “City School” in Byars, McClain County, Oklahoma. 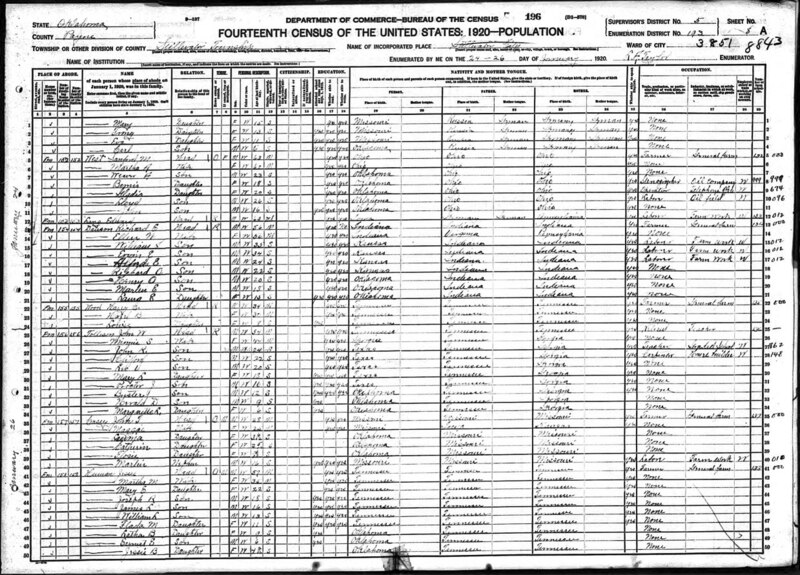 In 1920, his occupation is listed as “Teacher.” Stella Bowling also taught school before she married my great-great-grandfather Amos, and I speculated that she may have met J.W. Tolleson when they were in school together. 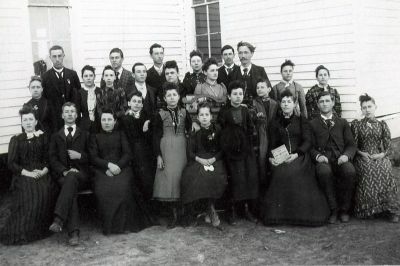 Parker Institute, the first school to offer college-level classes in Parker County, was established by a Mr. and Mrs. Bales in 1881 at Whitt in northwestern Parker County. In 1884 the Northwest Texas Methodist Conference selected the institute to be its flagship college in North Texas. The conference appointed Amos Bennett, a graduate of DePauw University, to be director of the school. For nine years he served as the institute’s administrator and only full-time faculty member. Assisted by instructors who had been his students in Kentucky and Texas, Bennett developed a curriculum that stressed traditional classical subjects, including Greek and Latin. Parker Institute graduated three or four students during its twelve years of existence. The first was Beulah Sprueill, who became a member of Parker’s faculty for some time. Two later had distinguished careers in the field of education. Jefferson Davis Sandefer, who graduated in 1892, served as president of Hardin-Simmons University for thirty years (1909-40), and Charles Shirley Potts, who graduated in 1893, served as dean of the Southern Methodist University law school for twenty years. Parker Institute was not able to compete with the growing number of colleges that appeared in North Texas in the early 1890s. It surrendered its charter in 1893 and became a public school. The first graduate mentioned, Beulah Sprueill, was a friend of Stella’s. She mentions writing letters to her or receiving letters from her several times in her diary. At Ancestry.com, I found a family tree that included John William Tolleson and Minnie Susan Mathis, so working on the hunch that the information about his middle name was correct, did a Google search for John William Tolleson. I found a post at the Tolleson Family Genealogy Forum (Genealogy.com) written by Nancy Lewis who was looking for information about the Tolleson family. I replied to her post, and we have been conversing over e-mail today. After studying this photo and the school photo, I think J.W. Tolleson is in the Parker Institute photo. It is hard to tell with 100% certainty, given the differences in light and the age difference in the two photos, but I believe that he could be the tall man with a mustache in the top row. It is even harder to determine whether or not Minnie Mathis is in the photo, but she resembles the woman on the far right, front row. I was very interested to connect with relatives of Stella’s former beau, and I invite any other Tolleson researchers to connect as well. I also want to thank Nancy for sharing her family with us. To me, one of the great things about genealogy is being able to make connections like these. That is fascinating! Thank you so much, you have made my day. I would agree with you that that is my great-grandfather, John William Tolleson. I am going to see my Uncle and Aunt in November and will be going through their pictures. If I find anything interesting, I will send it to you. Another bit of information; the Mathis’s were strong Methodists and connected to the Ellis Family who did a lot to establish the First Methodist Church in America. It is interesting that the school was Methodist. Dana, thank you for sharing with me the diary. It has allowed me to meet another person who loves their family as I do. We continue our searches, sometimes coming to a brick wall, but with hope our journey continues. Isn’t the internet wonderful? Where would most of us be in recording our family history without it? As you continue your journey, remember that you have made some TOLLESON folks mighty happy with the information and picture of the school class you have shared with us. God bless and may you have successful hunting! If any TOLLESON relatives read this email that are decendance of James Marias TOLLESON and his wife Susan A.; Henry TOLLESON and his wife Mary D.; Elizabeth A. TOLLESON and her husband, R.B. DANIELS; or Cave Johnson TOLLESON and his wife Kate Hill, PLEASE contact me. Any idea of the names of JWT’s father, grandfather, or uncles? It might help to know that the Tolleson name was derived in Sweden, we used to be up until the early 1800’s Tollefsons, one of our anscestors did not like the f in the name and took it out. I believe I am related to John William, my grandfather, whom might be a son/grandson to John, is William Willard Tolleson (passed in 2001). I will have to do more research. 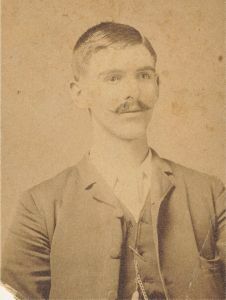 James Marias TOLLESON came with his family to Tennessee from North Carolina. They settled in the Red River District which is now known as Adams, TN. At some point, he married Susan A. and they had four children before his death and the 1850 Census. He is first shown listed here in 1840. My uncle, Maurice Tolleson remembers his father talking about Susan A. riding horseback and holding a baby as she came to this area. Where she met and married James M. is not known. She was listed on the estate settlement papers filed in Robertson County just as Susan A. No children are shown but two had been born in 1840. Mother Susan A. Tollison age 35 was born in TN as were all of her children. John P.11 male * My line is through John Pickney TOLLESON. It is known that John Pickney visited relatives in White County Tennessee. I do not know the connection. It is my hope someone will contact me with this information. 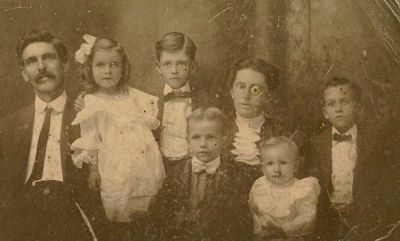 John William Tolleson’s mother was Frances Connell. She was John Pickney Tolleson’s second wife after his first one died. JWT was their only child. JOHN P. (PICKNEY PINCKNEY)2 TOLLESON (JAMES MARIAS1) was born 08 Jan 1838 in Tennessee County: Robertson, and died 04 Jan 1921 in Tennessee County: Robertson. He married (1) MARY FRANCES CONNELL. She died Unknown. He married (2) LUCINDA JANE ROSSON 12 Apr 1859 in Tennessee, County: Robertson, daughter of SAMPSON ROSSON and MARINDA BOBO. She was born 27 Mar 1840 in Tennessee, and died 11 May 1863. 8.	i.	JOHN WILLIAM3 TOLLESON, b. 04 May 1865, Tennessee County: Robertson; d. 04 Jan 1921, Stillwater, Oklahoma. 9.	ii. LILLIAN MAY3 TOLLESON, b. 28 Mar 1860, Tennessee; d. 17 Mar 1933, Robertson County Tennessee. 10.	iii. JAMES SAMPSON TOLLESON, b. 28 Dec 1861, Tennessee; d. 16 May 1927, Adams, TN County: Robertson. Please contact me if we connect. That makes a lot of sense. I know Bolling/Bowling/Boulding/Bolding/Bolden/etc. has the same issue. I have Bowlings in my family that started out as Bouldings when they came to America. A switch from an “i” to an “e” would be fairly common, I should think. I noticed that the mothers on John William, Sam and Lilly are mixed up. Lucinda Rosson was John Pickney Tolleson’s first wife and mother of James Sampson Tolleson (my grandfather) and Lilly Tolleson. His second marriage was to Mary Frances Connell. I apologize for that error. I have removed my website to update it and correct it. I hope to hear more from the Tolleson Line I am in. Thank you !! I am doing historical research regarding a J. W. Tolleson who may have been the Superintendent of a small I.T. town called Bradley in Grady County Oklahoma around 1904-1906. I’m referencing a newspaper snip that mentions him and his background in the Chickasha Daily Express from Sept 1905. His name appears to have been misspelled but later he is mentioned with the correct spelling. I see from some old blog discussions that you were involved with, that you may have connections to the family whom could help me validate this was the same man from your discussion. Some of the bio info seems different than this link but both of them have his roots from north central Tennessee and graduating from a local college about 50 miles from where he was born. He then taught in Paducah, Kentucky (just across the state line)briefly before coming to I.T. before Oklahoma statehood. It leaves out his stint at the Parker Institute in Texas but he may have been a teacher there and not a student as he was in his mid 20’s by then and was addressed as professor in the newspaper clip. Thanks for any help or connections to his family you can provide.